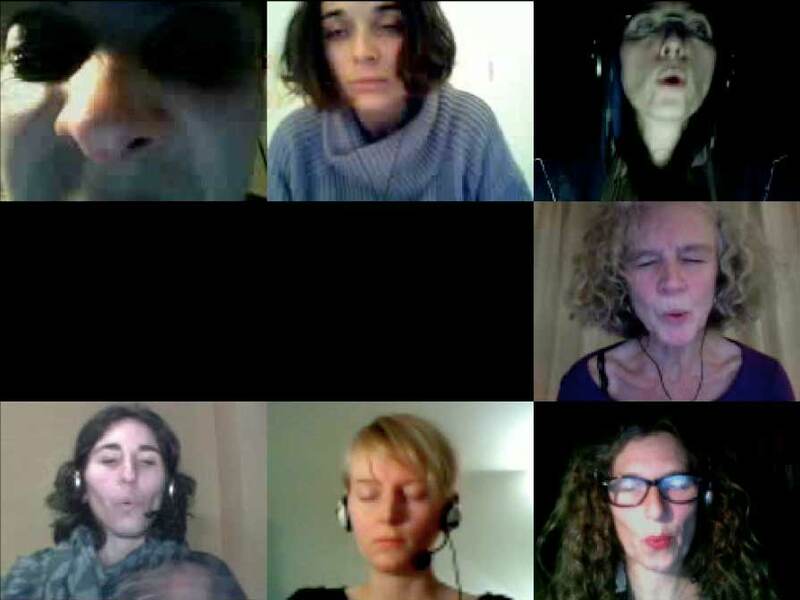 Lead performance, invited by Garrett Lynch for the conference Remote Encounters – Connecting bodies, collapsing spaces and temporal ubiquity in networked performance. On Love: nothing can go wrong, all is part of the game, but you should never abandon. Article Meaningful connections: exploring the uses of telematic technology in performance by Elena Perez in Liminalities issue 10.1 Special issue of the journal of performance studies, Liminalities, based on the outcomes of the Remote Encounters: Connecting Bodies, Collapsing Spaces and Temporal Ubiquity in Networked Performance conference in 2013. Edited by Garrett Lynch (University of South Wales) and Rea Dennis (Deakin University). Conversations between Antye Greie (aka AGF) et Annie Abrahams II – une série de Domestic Streaming Performances. Performances de 5 à 30 minutes – possibilité de échange tchat pendant et après. Performances between 5 and 30 minutes long – possibility to chat during and after. In August 2010 Annie and Antye did A Meeting is a Meeting is a Meeting – a first series of 9 Domestic Streaming Performances. interview for Digimag 58, October 2010 by Maria Chatzichristodoulou. Digital songwriter, sound composer and poet – Born 1969 in East Germany lives and works in Hailuoto, Finland. Known also as AGF. Focus of work includes the relationship between language and sound, audiovisual live performance, digital communication, sound installations and commissions for movies and theater. Throughout her career, Greie has released 20 long player records and numerous collaborations under such aliases as AGF/Delay (with Vladislav Delay), Greie Gut Fraktion (with Gudrun Gut), and The Lappetites (with Kaffe Matthews and Eliane Radigue), many collaborations with the award-winning classical composer Craig Armstrong. Greie also runs her own production company, AGF Producktion, and has produced records for other artists, including Ellen Allien (SOOL, 2009, BPitch). Compositeur Digital et poète – Né en 1969 en Allemagne de l’Est vit et travaille à Hailuoto, en Finlande. Connu aussi comme AGF. L’objet de son travail comprend la relation entre le langage et le son, audiovisuel live performance, la communication numérique, des installations sonores et des commissions pour les films et le théâtre. Tout au long de sa carrière, Greie a publié 20 disques et a participé à de nombreuses collaborations sous des pseudonymes tels que AGF / Delay (avec Vladislav Delay), Fraktion Gut Greie (avec Gudrun Gut), et The Lappetites (avec Kaffe Matthews et Eliane Radigue), et avec le compositeur classique Craig Armstrong. Greie dirige également sa propre société de production, AGF Producktion, et a produit des enregistrements pour d’autres artistes, notamment Ellen Allien (Sool, 2009, BPitch). Docteur en biologie (Université d’Utrecht 1978) et diplômée de l’école des Beaux-Arts d’Arnhem (1986). Son travail, qui utilise aussi bien la vidéo, la performance que l’Internet, questionne les possibilités et les limites de la communication, dont elle explore plus spécifiquement les modalités propres au réseau. Elle est internationalement reconnue en tant que pionnière de la performance en réseau. Elle a fait beaucoup de performances et a largement exposé son travail en France, y compris au Centre Pompidou, à Paris et dans de nombreuses galeries internationales, dont le Black Mountain College Museum + Arts Center à Asheville, North Carolina, US ; Espai d’Art Contemporani de Castelló, Espagne; le New Musem à New York; Furtherfield gallery (formerly HTTP), Londres; le NIMk à Amsterdam et dans des festivals internationaux comme le Moscow Film Festival, le Festival international du film de Rotterdam et Stuttgarter Filmwinter, et sur des plateformes en ligne comme Rhizome.org et Turbulence. Du 28 octobre 2011 au 1 janvier 2012 le Crac de Sète lui consacrera une exposition personnelle sous le titre Training for A Better World. a show curated by Anna Smith and Nathalie Boobis, Wigan UK. Where to find wilderness when you are at home? Sound : Antye Greie. Reading a text on collaboration together. Playing a ping pong game. Turning around… Sound Antye Greie. The relation didn’t exist, it came into being. 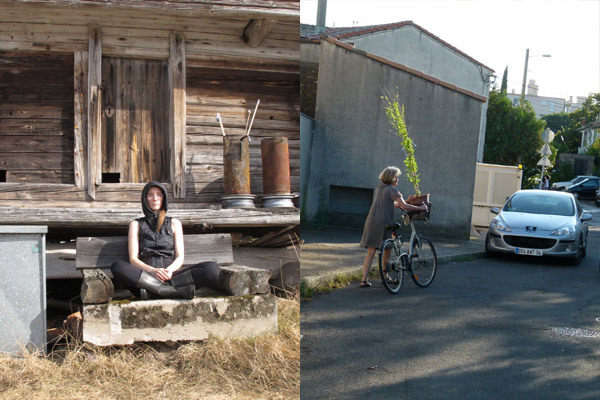 During their holidays, every day from the 5th till the 14th of August, Annie Abrahams in Montpellier, France and Antye Greie in Hailuoto Finland, will meet for 5 minutes. With text, sound and images they will explore, using a special webcam interface developped by Estelle Senay Théâtre Paris-Villette / x-réseau, a different theme in each session. Love, communism, wilderness, news, collaboration, space, patriotism are among them. A Meeting is a Meeting is a Meeting is included in You Say Tomato, I Say Tomato, show co-curated by Anna FC Smith and Nathalie Boobis, Wigan, UK. This exhibition brings together a collection of 21 local and international artists and poets investigating the nature of linguistic disagreements. The concept of the show is inspired by Wittgenstein’s notion that every conversation is a game in which each player inevitably has their own rules. 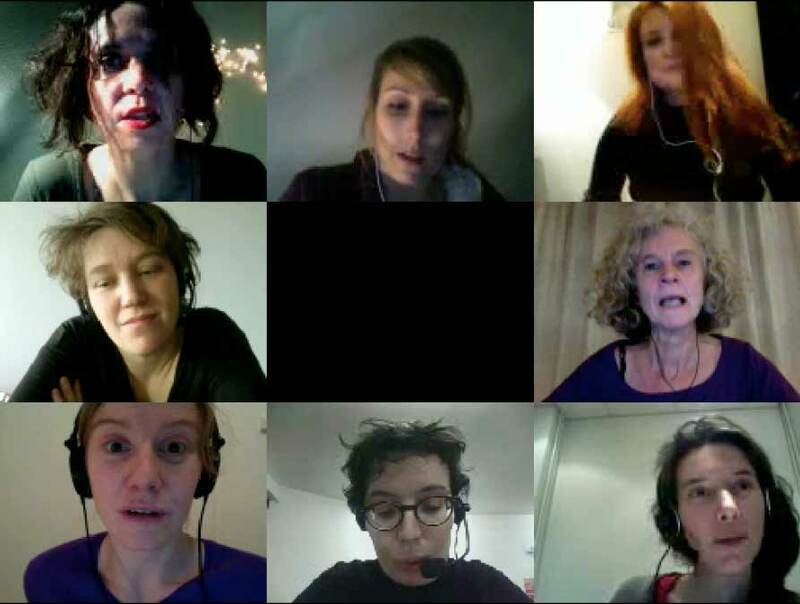 Telematic performance with AGF, Antye Greie from Hailuoto Finland, Pascale Gustin from Paris France, Maja Kalogera from Madrid Spain and Helen Varley Jamieson from Wellington New Zealand. 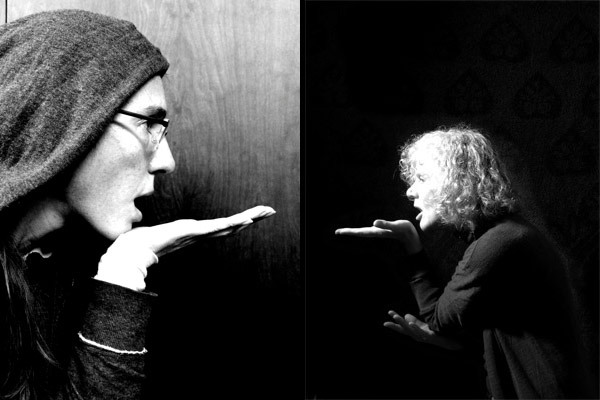 Join us either in HTTP in London at 8.30 pm or at Kawenga in Montpellier à 21h30.